Begining July 22nd, SpaceX is currently scheduled to perform three Falcon 9 droneship recoveries, a fairing recovery, and a Dragon recovery in less than two weeks. A total of five recoveries in short succession paves the way for an unprecedented amount of activity from SpaceX’s fleet of recovery vessels. The fleet operates out of the Port of LA in California to support Vandenberg launches and Port Canaveral in Florida to support Cape launches. Dragon recoveries are also executed out of the Port of LA. In total, the current fleet consists of one Fast Supply Vessel (FSV), four smaller crew boats, and two Autonomous Spaceport Droneships (ASDS or droneship). Additionally, a tugboat is also required to tow each ASDS. 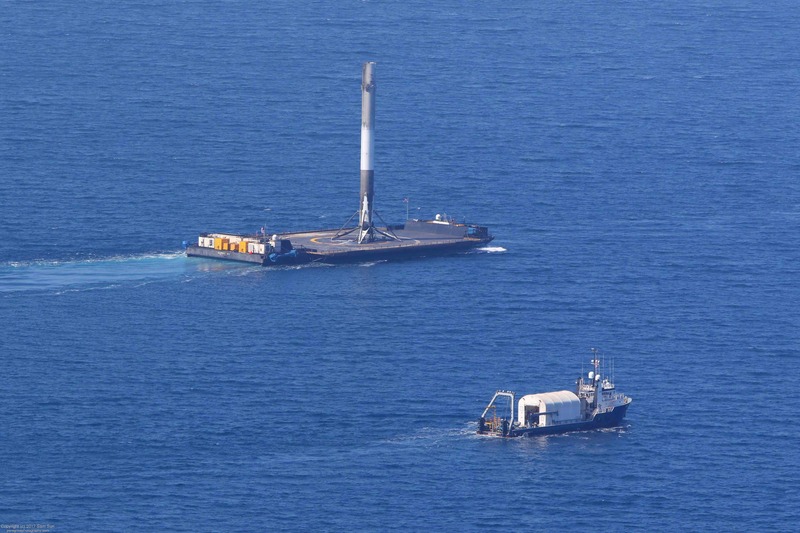 The boats are owned and operated by other companies for SpaceX – a common practice in the maritime industry. When a Falcon 9 or Falcon Heavy core is unable to return to land due to the mission’s requirements, SpaceX will often position an ASDS downrange to allow for a first stage recovery. While the ASDS is the landing platform, it is not the only ship required to enable a recovery. First of all, the droneships do not make the journey out to sea by themselves. They only operate autonomously when holding their position ahead of a landing attempt. As a result, the droneships are towed by a tug when being transported to and from the landing location. Over the past year, the tugboat Hawk has been supporting nearly all of the Cape based missions which utilized the droneship Of Course I Still Love You (OCISLY). The only exception to this were the two most recent OCISLY recoveries. During the TESS and Bangabandhu missions, Hawk was in Tampa Bay for maintenance. Therefore, the tug Rachel was utilized. Hawk has since finished her maintenance and is towing OCISLY for the upcoming landing attempt during the Telstar 19V mission. The launch is currently scheduled for no earlier than July 22nd. As far as the west coast goes, the tugboat which pulls the droneship Just Read the Instructions (JRTI) has never been consistent. Furthermore, there has not been a JRTI landing since October 2017. Therefore, it is a complete mystery as to which tug will be used for the landing during the Iridium-7 mission on July 25th. Apart from the tugboats, a crew boat is also needed to support the droneship recoveries. These vessels house the crew needed to secure the rocket post-landing. The boats also gather telemetry from the booster. The ship NRC Quest is used to support JRTI and GO Quest supports OCISLY. 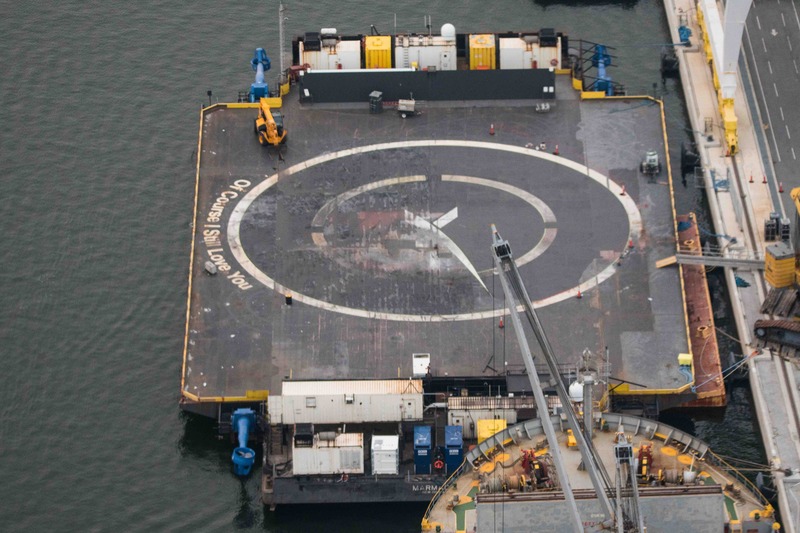 For a typical mission, the droneship will leave port 3-4 days in advance of the landing attempt. The tugboat typically pulls the ASDS at approximately 6-8 knots. The crew boat is capable of traveling at a faster 8-10 knots, and thus sometimes leaves port a few hours after the droneship. When returning from a successful landing, the crew boat will accompany the droneship back to port so that the crew can assist the booster. 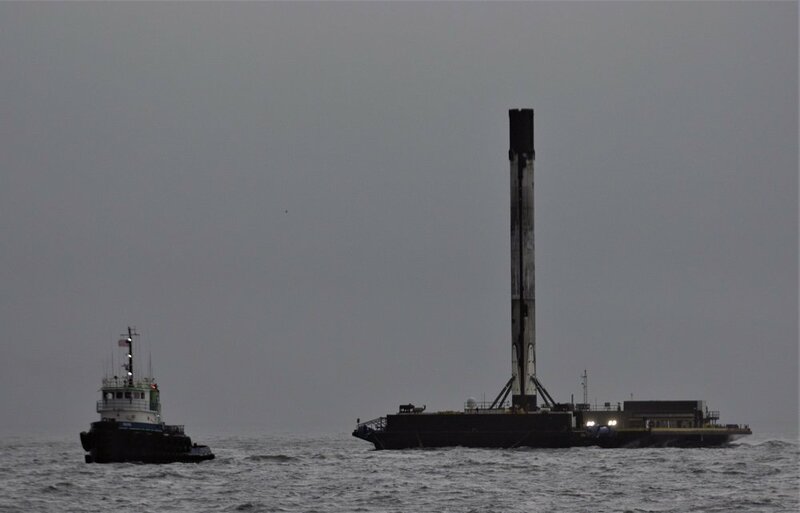 The crew boats may also be used when no landing is attempted, as SpaceX will often elect to perform experimental recovery tests during expendable missions. Therefore, the vessel will be deployed to collect telemetry from the later portions of the test when the Falcon 9 is out of range from the ground-based tracking stations. As for the droneships themselves, while OCISLY has been regularly used over the past several months, JRTI has been out of action. This has been due to SpaceX’s regular use of flight-proven boosters for Vandenberg based missions. SpaceX has elected not to refly Block 3 and Block 4 cores more than once. Consequently, the boosters have been expended on their second flight. The Iridium-7 launch will see JRTI return to action after approximately eight months on the sidelines. The mission will feature B1048 – a new Block 5 core. On the east coast, fleet watchers have been eagerly awaiting the arrival of A Shortfall of Gravitas (ASoG). SpaceX CEO Elon Musk announced on Twitter earlier this year that a new droneship was under construction to support Falcon Heavy missions where both side boosters require a droneship. Additionally, having two east coast droneships would enable a faster launch cadence. Afterall, it can take over a week for OCISLY to support a single recovery attempt. Therefore, if SpaceX wants to perform two missions requiring an ASDS landing in a short period of time, another droneship would be required. However, it is now understood that the construction of ASoG has been temporarily paused. The pause makes sense when considering SpaceX’s 2019 manifest. Earlier this year, the company’s president Gwynne Shotwell told CNBC that next year will see a decrease in the company’s launch cadence. The slip is due to a decline in the number of large geostationary communications satellites needing a launch. Missions to a geostationary transfer orbit make up the majority of launches requiring a droneship recovery. Therefore, it is unlikely that two east coast droneships will be needed to support Falcon 9 over the next year or two. Furthermore, there are also no known Falcon Heavy missions which would require the side boosters to land on droneships. With this in mind, there does not appear to be a short-term need for ASoG. That being said, it is understood that ASoG remains part of SpaceX’s long-term plans. 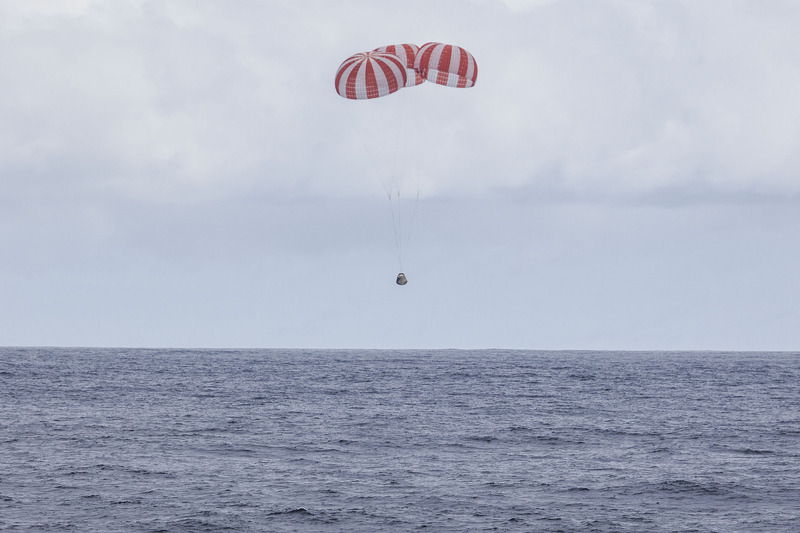 Currently, SpaceX’s Dragon cargo capsules return to Earth via parachute and splash down in the Pacific Ocean. They are then hoisted aboard NRC Quest – the same crew boat used to support JRTI. Next, after being unloaded at the Port of LA, Dragon is sent to SpaceX’s test facility in McGregor Texas. From there, Dragon returns to the Cape for its next mission. To simplify the process, for the upcoming Dragon 2 missions, SpaceX will look to return the Dragon capsules off the east coast of Florida. This will allow Port Canaveral based GO Searcher to return the capsule, crew, and cargo to a location closer to the launch site. 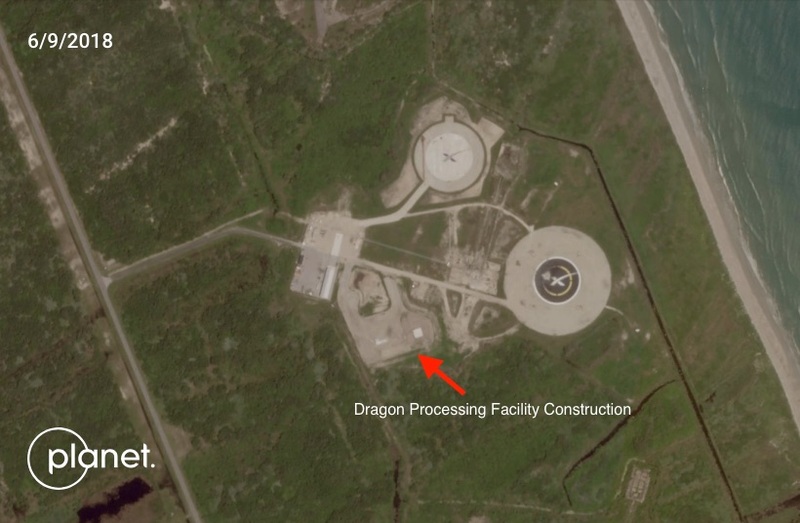 At Cape Canaveral, SpaceX is currently constructing a new Dragon processing facility near the company’s landing zones. The new facility will eliminate the need to transport the capsule across the country after each mission. Satellite imagery of the SpaceX landing zones and Dragon processing facility construction via Planet Labs. However, while the preferred landing location will be off the east coast of Florida, SpaceX will still have the option of returning the capsules to the Pacific Ocean in the event that weather is not acceptable in the Atlantic. Additionally, SpaceX is also looking into the option of landing the capsules in the Gulf of Mexico for additional flexibility. Earlier this year, the company filed for an FAA Reentry license to enable this possibility. To support the important Crew Dragon missions, GO Searcher has been undergoing modifications. 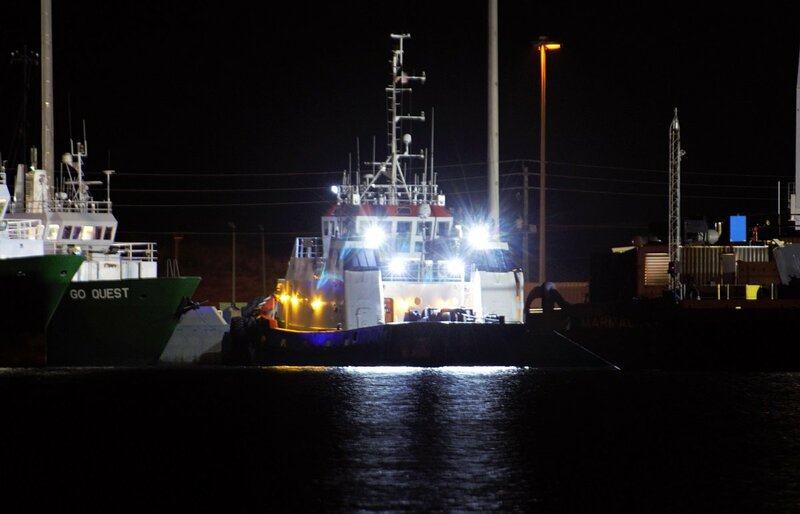 It recently returned to Port Canaveral with a large dome on its bridge – likely a new tool to aid the recovery process. On top of that, a few new structures have been built on GO Searcher’s deck which may potentially be used to house Dragon’s crew post-landing. GO Searcher has been working with NASA to refine the recovery process for crewed missions. 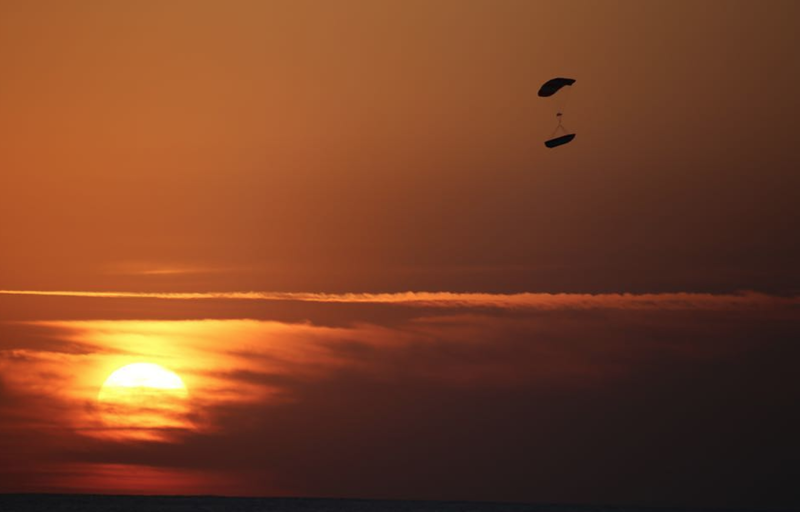 Several training sessions with a mock Crew Dragon capsule have been held off the coast of Florida. These sessions will help ensure that GO Searcher is prepared for the first east coast Dragon landing. Currently, the first Dragon mission to land on the east coast is not confirmed. However, the most likely candidate is the first Dragon 2 flight designated Demonstration Mission-1 (DM-1). The mission is an uncrewed test flight for NASA’s Commercial Crew program and scheduled to launch later this year. In 2018, SpaceX has significantly ramped up their efforts to recover the fairing which protects the payload during launch. To do so, SpaceX plans to capture the fairing halves in a large net attached to a vessel. For Florida launches, GO Pursuit has been deployed to support every launch featuring a fairing. However, the vessel is not equipped with a net, and therefore a full recovery is not possible. That being said, GO Pursuit can still monitor the fairing halves as they descend and lift them aboard after a soft splashdown in the Atlantic Ocean. Starting with the PAZ mission from Vandenberg last February, Mr. Steven has made an attempt at a catch on each west coast mission. To date, three full fairing recovery attempts have been made – all of them unsuccessful. However, while Mr. Steven is yet to catch a fairing, SpaceX is making progress. In recent launches, SpaceX has made noticeable improvements in the parafoil system which controls the fairing halves as they descend through the atmosphere. GO Pursuit and Mr. Steven are now regularly returning intact fairing halves to port albeit wet. 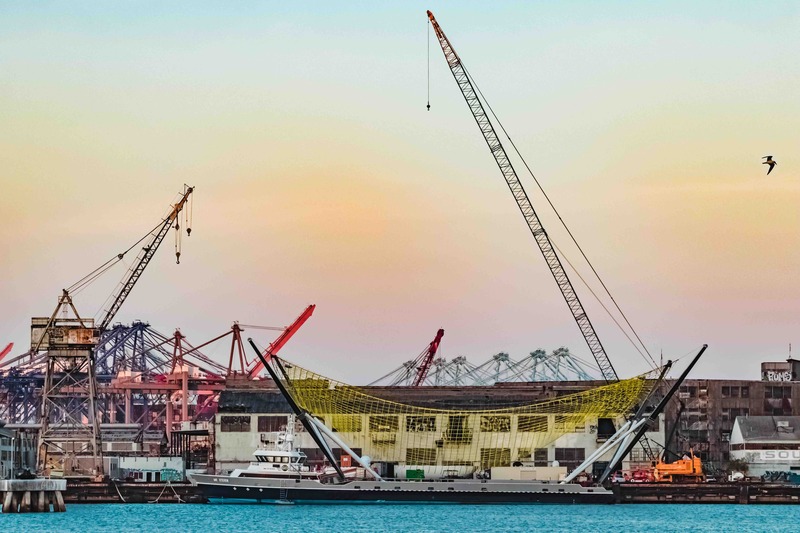 To increase the odds of success in the future, Mr. Steven has been undergoing modifications at the Port of LA to allow for a net four times as large as the previous version. 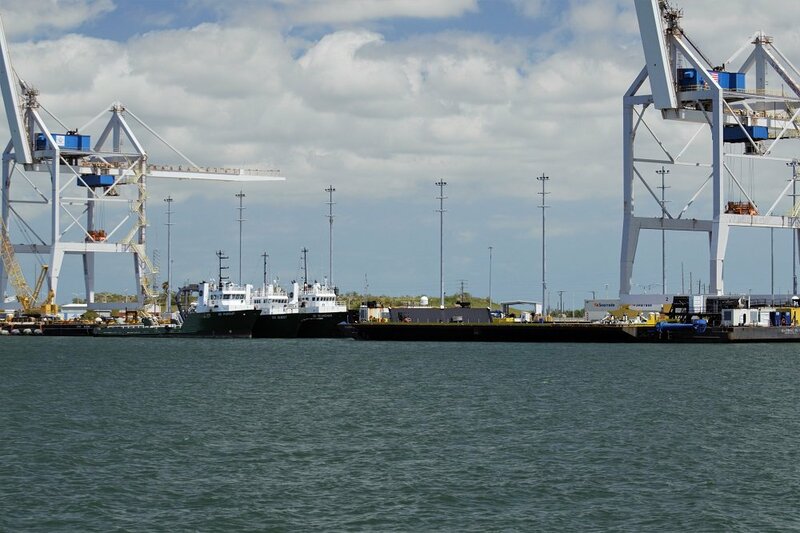 The construction has been taking place at Berth 240 – the same Berth which SpaceX has recently leased to build the next generation BFR rocket (Big Falcon Rocket). So far, the modifications have progressed at a rapid pace with four new arms and a net all being assembled in a matter of days. Therefore, the new hardware is ready in time for the next Vandenberg launch on July 25th, when a Falcon 9 will launch the Iridium-7 mission. In the meantime, Mr. Steven’s crew have been performing practice recovery operations. Data available on MarineTraffic.com showed that Mr. Steven performed what appeared to be a test run on June 28th, 2018. Interestingly, a NOTAM was filed with the FAA for the location of Mr. Steven, potentially signaling that a fairing half may have been dropped from a helicopter as part of the test. Musk had previously stated on Twitter that fairing drop tests were going to be performed, but did not specify if Mr. Steven would be involved. However, it is known that the net construction was not completed at the time. Therefore, Mr. Steven’s crew would have had to let the fairing hit the water before collecting it. NRC Quest was also in the vicinity of the apparent test – potentially to help monitor the results. While Mr. Steven has performed numerous test runs in the past, this was the first to appear to have a corresponding NOTAM and the first to have NRC Quest accompanying Mr. Steven. More recently, Mr. Steven has been conducting practice sessions with the addition of the new net. MarineTraffic data has shown Mr. Steven executing numerous tight turns and dramatic changes of speed. Additionally, a drone video has also been captured which shows Mr. Steven operating in reverse. “The third method is Joystick mode, where the vessel operator (Captain or mate) uses a joystick to operate the thrusters and propulsion systems in unison – giving the vessel commands along 3 axes using the joystick controller.” It is this mode that Herbert believes is the best suited for a fairing recovery operation. Once SpaceX has refined the fairing recovery process using Mr. Steven, the next step will be to enable recoveries on the east coast. The amount of ships needed is not yet known, as it has not been confirmed if Mr. Steven is capable of recovering both fairing halves in one mission or if two ships are needed for a full recovery. However, it is highly unlikely that GO Pursuit is capable of being converted into a fairing recovery ship. 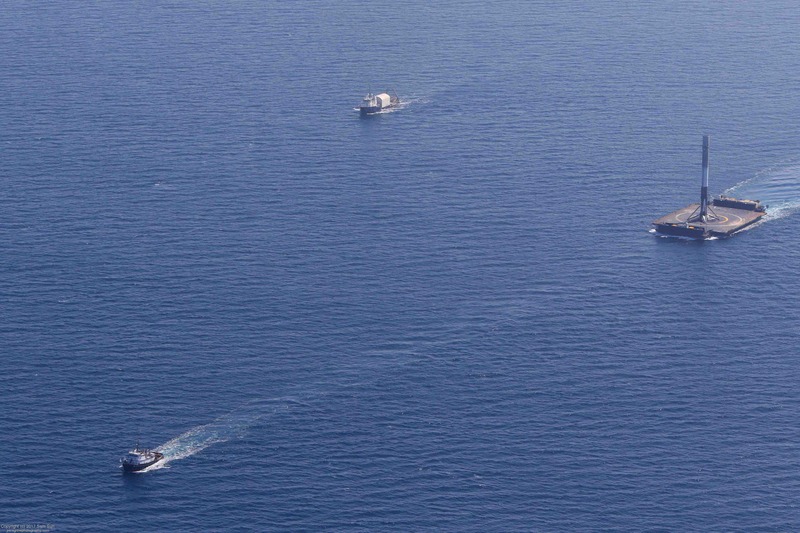 This is due to the vessels slower top speed and smaller size relative to Mr. Steven. If only one ship is needed for a recovery, then SpaceX would simply need to add one more ship to their fleet. If two ships are needed, SpaceX will have to add three new boats to their fleet – one on the west coast and two on the east coast. Between July 22nd and August 3rd, SpaceX is currently scheduled to perform five recoveries (three Falcon 9 first stages, one Dragon, and one fairing) and two fairing collection tests in less than two weeks. Wednesday morning, Hawk towed OCISLY out of Port Canaveral and began the journey down range to support the first stage landing during the Telstar 19V mission on July 22nd. GO Quest and GO Pursuit also left port a few hours later. As usual, GO Quest will be supporting OCISLY during the first stage landing. GO Pursuit will perform additional fairing recovery testing by attempting to collect the fairing halves after they splashdown in the Atlantic Ocean. As GO Pursuit is not capable of catching a fairing half like Mr. Steven, this event is not counted as a full recovery attempt. Following the Telstar 19V mission, Hawk, OCISLY, GO Pursuit, and GO Quest will race back to port to unload the rocket hardware and prepare for their next recovery operation during the Telkom-4 (Merah Putih) mission. 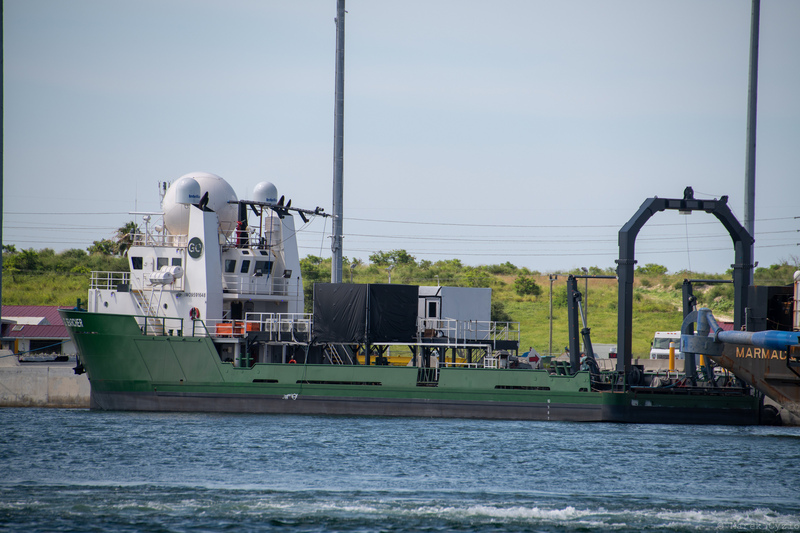 Telkom-4 is scheduled to launch on August 2nd, and the east coast recovery fleet will perform a nearly identical operation to the Telstar 19V mission. If the schedule holds, less than eleven days will separate Telstar 19V and Telkom-4 – making this SpaceX’s fastest turnaround of a droneship. In the meantime, SpaceX’s west coast fleet will be supporting the Iridium-7 recoveries on July 25th. During this mission, the first stage will attempt to land on JRTI which will be assisted by the crew boat NRC Quest. Additionally, Mr. Steven will attempt to recover a fairing half. This fairing recovery attempt will be the first with Mr. Steven’s larger net and the first to be executed in darkness. Furthermore, the Iridium-7 launch will also be the first to feature both first stage and fairing recovery attempts. Finally, following the Iridium-7 mission, NRC Quest will race back to port to prepare for the final recovery of the two week period. The Dragon capsule from the CRS-15 resupply mission will splashdown in the Pacific Ocean on August 3rd. Following the splashdown, NRC Quest will lift Dragon onto her deck before returning the spacecraft to the Port of LA.